From the first article I read, I have been haunted by the death of 17-year-old Trayvon Martin at the hands of an overzealous, self-appointed “neighborhood watch captain” who deemed the teen’s very presence suspicious. So George Zimmerman stalked Trayvon, confronted him and ended up shooting him with a 9mm handgun. Trayvon had walked to a convenience store for a bag of Skittles and a can of iced tea. His only crime seemed to be Walking While Black. And Zimmerman? Hasn’t even been arrested yet. If you haven’t yet, please read our very own Christina’s post about Trayvon. I’ve been so upset by this tragedy, this vicious, senseless act, but Christina’s post finally helped me pin down exactly what I’ve been feeling. It had me sobbing as I grappled with rage and fear and impotence. And now I think I know why Trayvon’s death hit so close to home: my son is brown. He might someday fall under the same “suspicion” that led to Trayvon’s murder. I pray for Trayvon, for his parents. I pray for all of us. 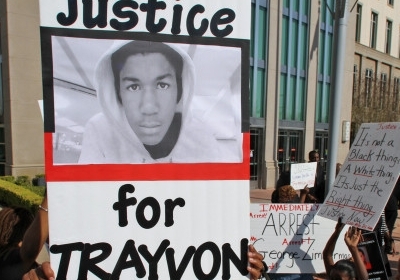 If you haven’t yet, please sign the petition urging for the prosecution of Trayvon’s murderer. Thanks to ongoing public pressure, the U.S. Department of Justice, the FBI, and the Florida Department of Law Enforcement have launched their own investigations. Last night, the Sanford City Commission gave the police chief a vote of no confidence, adding to a widespread call to oust him. Please, make your voice heard. What’s on your mind today?